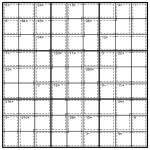 This entry was posted by Gareth Moore on May 1, 2009, and is filed under Killer Sudoku, Killer Sudoku Variants, Sudoku, Sudoku Variants. Follow any responses to this post through RSS 2.0. You can leave a response or trackback from your own site. Nice change. Not hard. Division cages feel as if they will be very easy to deduce since the dividend can’t be above 9 in value. I would call this puzzle “MathDoku”. In the case of generating more interest, that would be like calling sushi “Cold Raw Fish” since many hear the word maths and flee. … but I still like the name. Am i missing something? Spittledung says it’s not hard, but look at the bottom RH box – it doesn’t work! So now, in the bottom right box, we have 1,2,3,4,5,8,9, and we have 2 empty boxes – where to place the 6 & 7? The 7 can’t go in the 3- box because that would require a 10 from which to deduct 7 to get 3. So the 6 has to go in the 3- box … but wait a minute, that means the other digit has to be 9: 9-6=3 right? But there is already a 9 in the bottom row…. Or, as I said, am I missing something? I believe the something you might be missing is that the digits can be in any order for subtraction cages so long as the bigger number minus the smaller number gives the result, For the 0- cage in the same region, the biggest number in the cage minus the other two combined give 0. It is always great to see others commenting about puzzles. Please stick around Laine. Can’t have 7-4 or 6-3 in the 3- cage, that would put the 4 or the 3 in the square and the 24x cage already has both 3 & 4 in it! The larger number does NOT have to be the first one in the 3- cage (the one on the left). So by your deductions above it IS possible to have “4 (on the left) and 7 (in the region which you are deducing)” or “3 (on the left) and 6 (in the region which you are deducing)”. So it is possible to have either 4_7 or 3_6. Now continue solving…. Aha! Now I see I thought that as division & subtraction aren’t commutative, the larger number(s) had to go first, and this is the first puzzles I’ve done where my assumption hasn’t worked! The largest number DOES have to go first. It’s just that it doesn’t matter what order you write them in the grid. Pick the largest number from the cage and use that first, then subtract or divide by the other numbers in the cage. There are more of these in each issue of my Sudoku Xtra magazine – take a look at http://www.sudokuxtra.com.